« Exit–pursued by a bee! 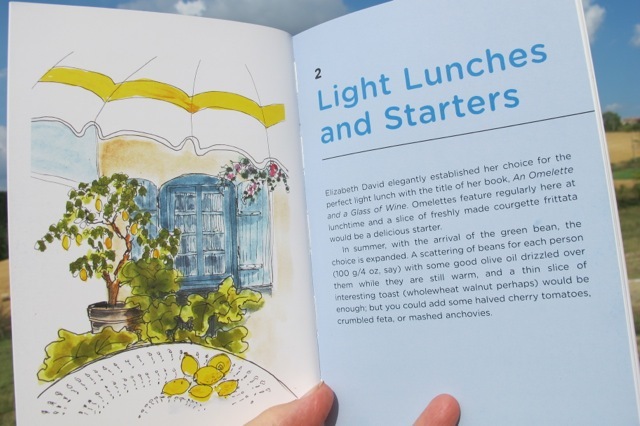 I’m planning a cooking workshop in Lautrec the first weekend in October, based on my cookbook, Delicious Dishes for Diabetics and healthy, simple recipes in the Mediterranean tradition. 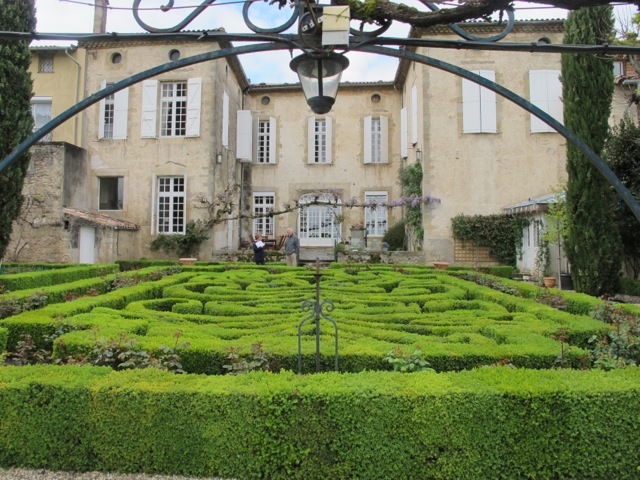 A three-and-a-half day workshop in Lautrec (department of the Tarn in southwest France), in a charming small hotel with a magnificent garden and lovely views. We’ll make our meals and eat them together. All meals and wine are included. Group size limited to about six people (non-cooking partners or traveling companions are welcome to come along and enjoy the meals we prepare for a supplement). All participants have their own private room with en-suite bathrooms. Preparing (and enjoying) healthy recipes based on the Mediterranean way of eating. My cookbook and blog will be the springboard for the recipes–depending on what is in season. Departure the following morning, Monday, Oct. 8th 2012–i.e. four nights, three full days and a half-day on arrival. Anyone interested in developing a wider repertoire of healthy recipes that can be enjoyed by the whole family. 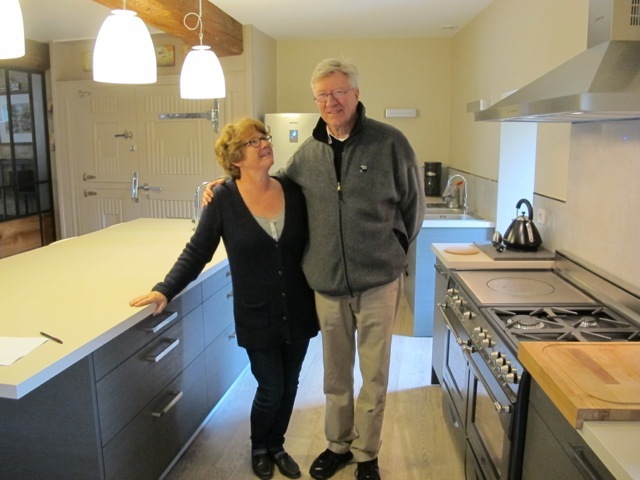 With Dominique, the owner of La Terrasse de Lautrec in the special workshop kitchen. 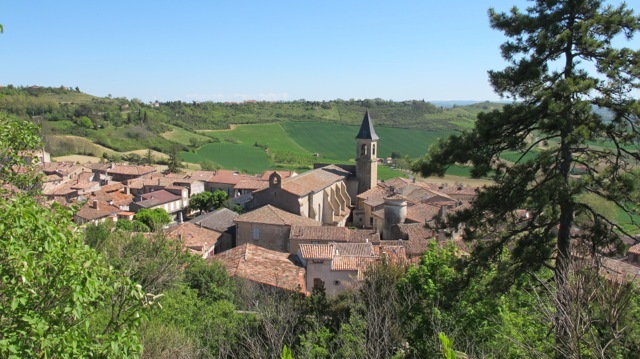 Lautrec is a medieval bastide–a fortified hilltop village with a population of about 1000 people. 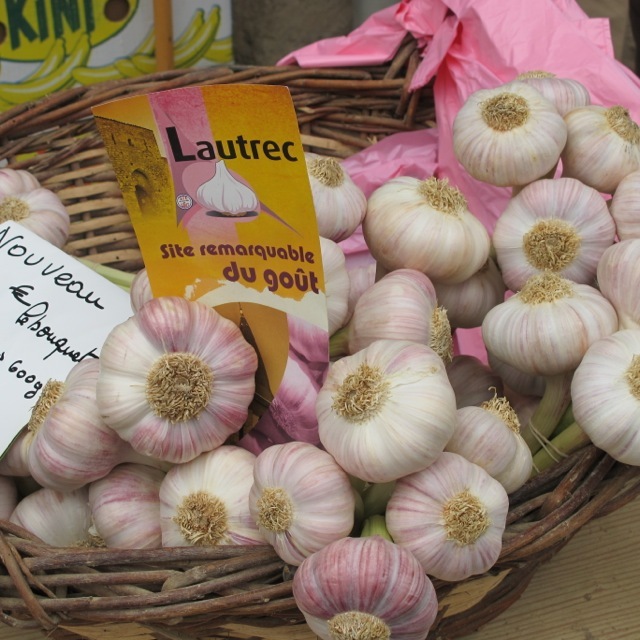 It is famous for it’s pink garlic (l‘ail rose)–one of the staples of Mediterranean cooking. The nearest airports are Toulouse Blagnac (about 1 hour 20 minutes drive) served by BA, Air France and Easy Jet amongst others. Carcassonne Airport (served by RyanAir) is about the same distance. Castres also has a small airport with a limited service from Paris. The nearest train station is Castres, about 15 minutes drive. Transportation from airport to Lautrec can be arranged for an extra fee. Note: the venue is not suitable for people with mobility problems–i.e. there are stairs to the first floor and no elevator. What a splendid idea! Ole! I will be there! Le sigh, how I wish I could! on May 14, 2012 at 11:14 pm | Reply Dianne P.
Oh, my gosh, this sounds like so much fun! And what a pretty little village! You prompted some serious discussion this evening…but it would be hard to plan going away in October (w/school). Any chance you might do anything in the summer months? The garlic festival would be neat to see–or do you have to plan years ahead due to the crowds at that time? Summer is the Hotel’s busy time and it wouldn’t be available. It’s a potentially busy time for us too, Dianne–family and friends’ visits etc..Autumn is a pretty time here as it is to my certain knowledge in New England! on May 15, 2012 at 11:16 am Dianne P.
Will you be making a video of this event? If Meredith has anything to do with it I suspect–yes! Oh yes! I would love to purchase a video of this workshop since there is no way I can leave my 17 children (I teach preschool) and make that hop over the pond yet. Great idea about the video. Please come to Yosemite and do a cooking workshop at the Ahwahnee Hotel. You will love it. My sister and I will come. We’d like to come to France, but we work here. It is hot and HUMID in Baltimore on this Memorial day. I am going to a crab feast tonight. I think a blogger a while ago described this feast. It only occurs in MD as far as I know. To have the feast a table is covered with paper. Crabs steamed in Old Bay seasoning are put in the middle of the table so every one can proceed to eat with a mallet in their hand to break the crab shell and pick the meat out with the hand. Cold beer is a great drink option. Usually the feast is held outside because of the mess. Clean up is easy. Just fold all the newspapers inward and throw the bundle away. Left over crab can be picked and put into vegetable soup (tomato based) to make Maryland crab soup…another Maryland Specialty. sounds delicious and simple–just the ticket. Hi just spoke to Jean Byrne and she has returned to Ireland raving about your weekend course , the food and the location and the company. Can you tell me when you are running your next courses? Jean and Clare were wonderful pioneers! I have much to thank them for. At the top of my blog you will see “Cooking Workshop”–if you click on that you will be able to read about the next one.